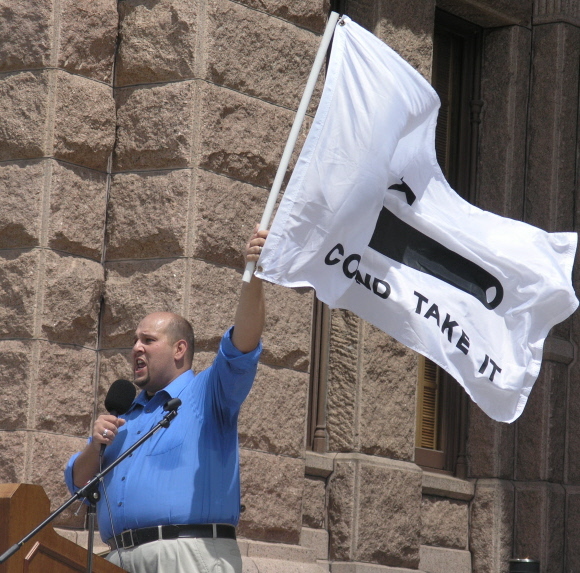 AUSTINï¿½Texas Nationalist Movement President Daniel Miller on Saturday challenged Gov. Rick Perry to prove that his rhetoric is ï¿½more than just pillow talkï¿½ by picking up the banner of state sovereignty during the Sovereignty or Secession rally at the State Capitol. 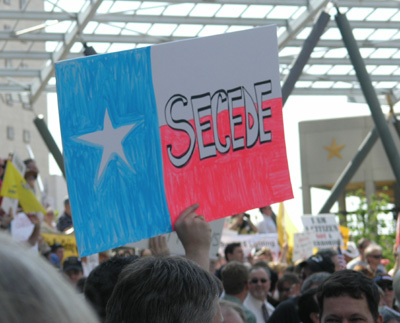 A crowd of Texas Nationalist Movement and other groups estimated by organizers to be in the vicinity of 1,500-2,000 people gathered on the south side of the Capitol Saturday to demand that Perry and state legislators either stand up for state sovereignty by nullifying federal legislation and regulation which intrudes on statesï¿½ rights, or start the process of secession. Miller called on his groupï¿½s members to embark on a ï¿½national day of actionï¿½ on Sept. 2, flooding Perryï¿½s office with phone calls demanding he call a Special Session of the Legislature to take up the sovereignty issue, as has been done in Tennessee, Montana and other states. Welcome to the national newspaper of Texas, the voice of the Texas Nationalist Movement. The federal government of the United States has run amok, and is going bankrupt both fiscally and morally. We are Texans who believe that Texas would be better off on its own. We've tried Washington's solutions, and they don't work. Texas won its independence from Mexico in 1836 on its own, and ruled itself for nearly a decade. The United States has broken its contract with Texas, and Texas wants a divorce. Debra Medina says she offers Republican voters a "true conservative" choice in the governor's race, and an end to the state property tax. Richard Garza-Ray says he wants to reach Texas voters with the message that independence is feasible, and to help set the agenda for that goal. TNM Membership Director Christopher Kenney has issued a call for TNM members to stand up and take leadership roles. U.S. Sen. Kay Bailey Hutchison has officially thrown her hat into the race for Governor, becoming the fourth Republican and sixth candidate overall in the campaign for the seat of incumbent Rick Perry. The federal General Accounting Office says that many of the companies operating unsafe buses and trucks evade regulations and continue to operate their death-traps even after they've been ordered to shut down simply by changing their names. 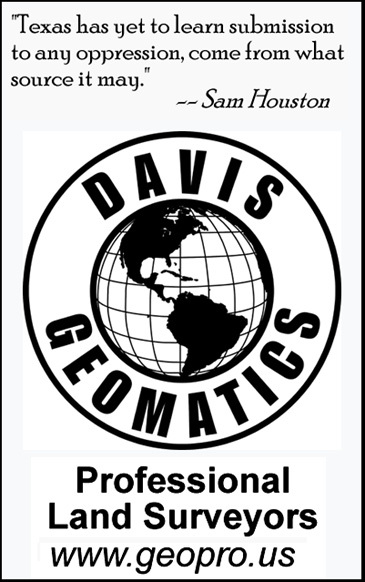 The military's Northern Command has asked Congress to set aside the Posse Comitatus Act of 1873 to enable the deployment of troops -- possibly even foreign troops -- in American communities during ill-defined "emergencies." Texas continues to lead the nation in both the production of energy from wind-pwoered sources and in the installation of new wind-powered generating facilities. 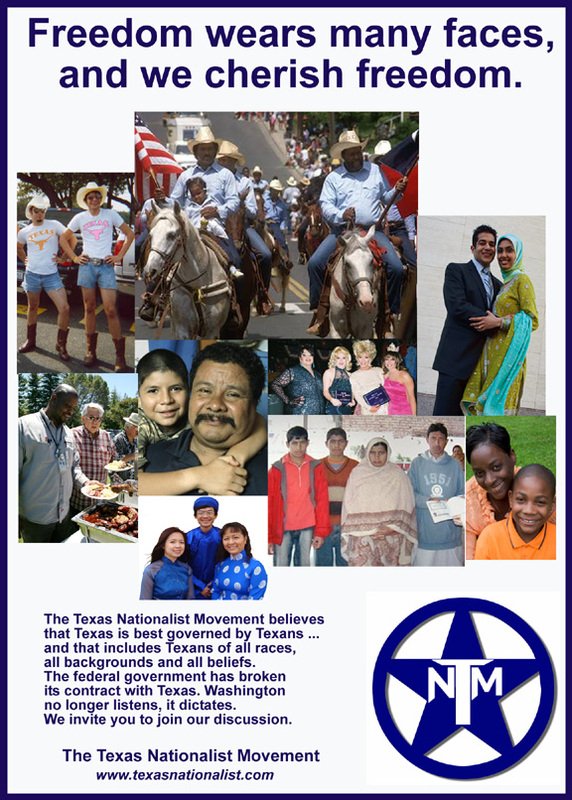 The Texas National Press resumes publication this month with one goal in mind: to tell the truth, and to dispel all the misconceptions about our movement. The worst distractions from 2008 are gone, and Cowboys coach Wade Phillips is planning to have his team launch the 2009 season without a sense of "entitelement." The Houston Texans enter the 2009 campaign in a position they're not used to: favored to win the division. They're not celebrating just yet, however.